The largest private shareholder of Rosneft – Britain's BP – fears the impact of U.S. sanctions against Russia on its business. For now the company has not experienced any problems, although the scope of economic restrictions have already impacted one of its assets – the oil refinery Ruhr Oel in Germany, which it owns on an equal basis with Rosneft. Britain's BP, which owns 19.75 per cent of the shares of Rosneft, believes that sanctions imposed against Russian companies and the Russian Federation may have an impact on its business as well. “If further international sanctions are imposed on Rosneft or Russia, it could have a material adverse effect on our relationship, our business and strategic objectives in Russia, as well as our financial condition and results of operations,” BP wrote in its second quarter financial report. The sanctions have hit the oil refinery Ruhr Oel in Germany, in which BP and Rosneft own 50% each. However, BP claims that “these will not have a significant impact”. Yesterday, the European Union also tentatively approved new sanctions against Russia. In particular, it will be forbidden to export high-tech energy equipment to Russia. The parties do not have any other joint projects, other than Ruhr Oel. However, the companies had been discussing the possibility of creating a partnership to work on the Arctic shelf. In addition, in late May, Rosneft and BP signed an agreement to work on the Domanik Deposits in the Volga-Urals Region. They plan to create a joint venture, with the Russian state-owned corporation getting a controlling interest. A BP representative declined to comment yesterday. However, the British company began to experience problems in the further development of business in Russia already in the spring of this year, when the banks HSBC and Lloyds refused to participate in a transaction involving the supply of petroleum products on a prepayment basis, that was concluded with Rosneft back in 2013. However, BP was able to obtain financing from other banks, and at the end of June, a contract with Rosneft was signed. Dudley sees no problems for BP also in the decision of the arbitration tribunal in The Hague, which ruled in favour of the petition of former Yukos shareholders against Russia, recognising that the company was expropriated and ruling that compensation, in the amount of $50 billion, should be paid. “This is a legal dispute between the plaintiffs and Russia,” said the head of BP. Representing the interests of the former Yukos shareholders, the Group Menatep Limited can start seizing assets of the Russian Federation. Its representatives did not rule out that they might try to seize Rosneft assets as well, but made it clear that they had no claims against BP. Yuri Nikolayev from the Nikolayev and Partners Law Firm believes that BP need not be afraid of any seizure of assets, as the decision of the arbitration tribunal applies only to assets directly owned by the Russian Federation. Moreover, Russia will appeal this decision, and any seizure of assets of Rosneft will be difficult from a technical and legal point of view, said the lawyer. Rosneft has been added to the list of sectoral sanctions imposed by the U.S. Treasury in mid-July – the company has had limits placed on obtaining credit from American banks. All the same, Kommersant sources say that there may be problems involving borrowing money from European banks as well. Already in April, the President of Rosneft, Igor Sechin, was barred from entry to the US. Nevertheless, these sanctions are clearly not the last – the EU is to decide on sectoral sanctions against Russia in the next few days, and the American sanctions may be toughened as well. BP became a shareholder of Rosneft in 2012. BP exchanged its 50 per cent stake in TNK-BP for a 12.84 per cent share in the state-owned company and $17.1 billion in cash. Of this amount, BP has spent $5.66 billion on shares of Rosneft, becoming the owner of a 19.75 per cent stake in the company. 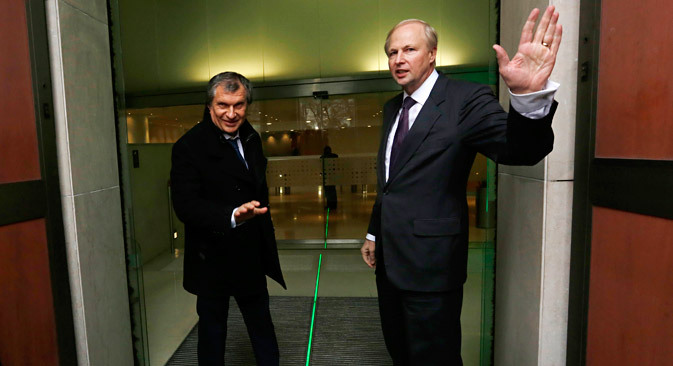 BP President Bob Dudley was elected to the Board of Directors of Rosneft in 2013. Read more: How will new round of sanctions affect Russia?